I am looking for your ideas for a band for our end of season concert next year (September 2012). If you have been to our concerts before then I do not need to explain to you how seriously fun they can be. Must be attainable for a 500 person venue without each person having to pay big bucks (for example, I am thinking Arcade Fire is no longer attainable–but you never know, I suppose). Ideas for others? Votes? Or maybe you have an inside track to a band that seems unattainable? Drop me a comment! 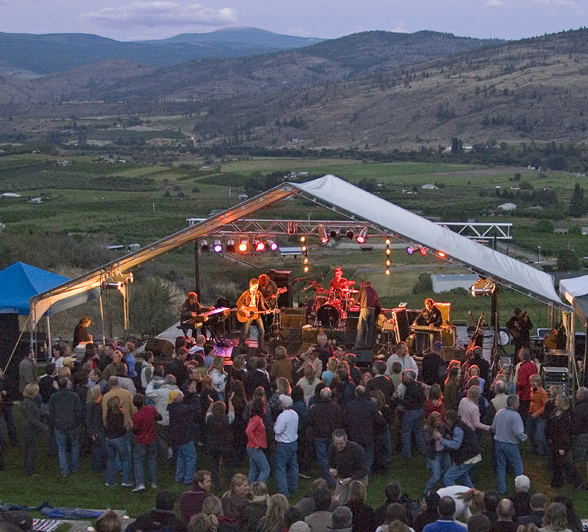 This entry was posted in Canada, TInhorn Creek and tagged bands, canada, Canadian, concert, dance, music, Tinhorn Creek. Bookmark the permalink. The New Pornographers, Tegan & Sara, Mother Mother, Dan Mangan, Black Mountain would be good possibilities! Or we put together a collection to get Arcade Fire! How about The Grapes of Wrath? Danceable and Canadian, fairly well known, and might not break the bank: The Sadies, The Dears, Wolf Parade. But I also like Brian’s: Tokyo Police Club, Black Mountain, Tegan & Sara. Broken Social Scene would draw a fairly large crowd, too. You know I have a soft spot for Sloan (ahem, would be the BEST season finale ever). Have fun choosing! I volunteer to be on the panel, and will even do research for you. Wow some good musical acts for consideration here. Has Bif Naked been suggested? Did I read on your twitter feed that this will be an anniversary year? This is not an anniversary year. I believe 2013 is for our large concert at the end of the year. Probably would love to get Colin James to come back for that one. I will add Bif Naked to list, thanks!